By Jolene Knapp, Senior Partner at Ideas for Action, LLC. Foresight is a leadership imperative. Here are some tools that will help you strengthen and grow your ability to stay attuned to and make sense of the external environment and implications for the future. As a CEO of an association or nonprofit organization, one of your daily challenges is striking the right balance between macro- and micro- level thinking. Success requires both. Your leadership role demands that you facilitate visionary thinking and stay abreast of industry-specific news, association best practices, and events in the world at large. At the same time, you must tune in to the inner workings of your organization, from regional politics and staff capacity to fund balance and competitors. No one in the organization has the breadth of exposure to information that you likely do. In other words, you’re responsible for “360 degree thinking”, a leadership competency that Jean Frankel and Gabriel Eckert describe in their book, From Insight to Action: Six New Ways to Think, Lead, and Achieve. They define it as “being cognizant of ideas and insights coming from a variety of sources, both internally and externally, and understanding the critical interconnectedness of these ideas.” It is about your ability, as a leader, to view ideas and information coming from all sides on all levels in all timeframes (for example, short, medium and long-term priorities). How can association leaders hone their ability to pay attention all of these things all at once? Or more importantly, how can 360 degree thinkers see the whole picture and yet create rational mechanisms to organize data flow? One way to address this is the creation of idea filters. What kind of information do leaders need when using 360 degree thinking? Do leaders need to consider industry information, competitor information, best practices in association management, general business and economic news, as well as global developments if the association’s scope extends to those interests? Leaders who think about these categories of information as filters are able to organize and access the most essential information at any given point in time. In practical terms, there are many free tools that can help you adopt a regular habit of scanning the environment and connecting the dots. Most important is finding a system or process that manages information in ways that make sense for you. Choose tools that can be customized. Do you prefer pictures, headlines, or full newspaper-style articles? Can resources in your feed be archived, excerpted and tagged? Can the flow of information be organized into useful categories such as topical news, governance, and ideas-to-borrow? 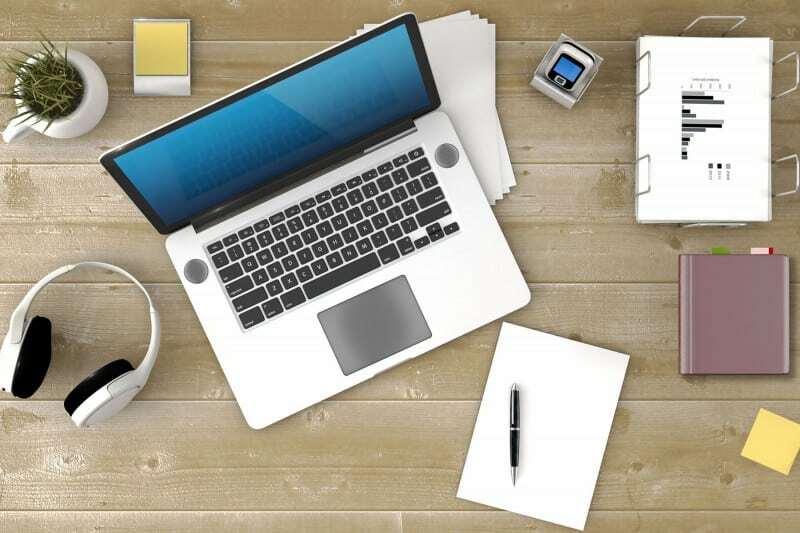 Here are three options that work well for me and several of my colleagues: Evernote, Feedly, and My Yahoo These tools address the first steps of scanning and curating information to feed your 360-degree thinking. In a future post, I’ll talk about ideas for engaging others, making sense of the threads, and using your scan for regular strategy-making. 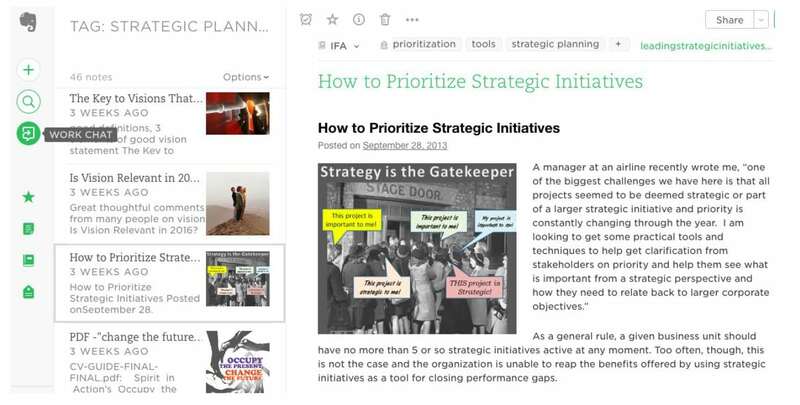 The ultimate curation tool for external content as well as notes you write yourself. Searchable, retrievable. Simple to use, but with such depth and capacity that it’s possible to become certified in its use. I use Evernote like a massive filing cabinet for emails, articles,. . . anything I come across while using scanning tools like those described below or during any routine reading. I don’t scratch the surface of its power, but love that I can tag, store, highlight and and retrieve excerpted sentences, paragraphs, articles, and reports. For example, in less than five seconds I can see everything that was ever worth saving about facilitation tools for strategic thinking in a non-profit environment – just by combining tags in my search. My personal favorite. Easy, versatile and infinitely customizable. 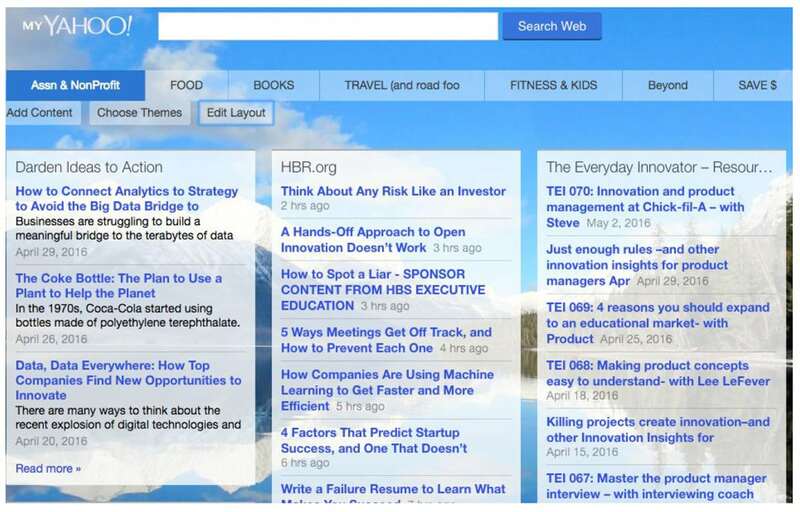 Install and click on a toolbar icon to collect feeds from selected blogs and websites, create custom categories, “read now” or “save for later”, view as headlines or pictures, see which items are being shared most frequently, read in-line or open in a new window, and share instantly by email, LinkedIn, Twitter, and more. The premium version interfaces with tools like Evernote. I use this nearly every day to quickly scan headlines to determine which to read and/or save. 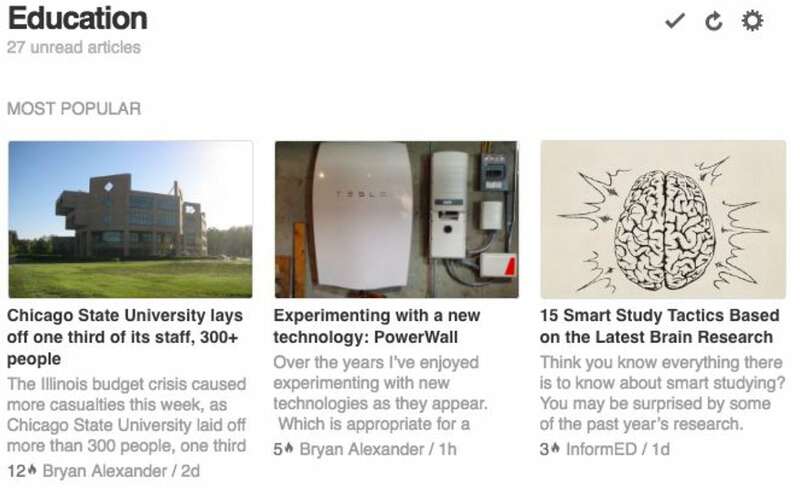 A single Feedly category (education) displayed magazine-style. Effective as a simple and colorful dashboard display reader, but lacks the powerful sharing, saving and sorting tools of Feedly. It’s easy to add feeds: Click on “Add Content”, or populate with RSS feeds directly from your selected sites by designating My Yahoo as your reader. Each scrolling screen or page (tab) displays an infinite number of custom feeds in two, three, or four columns. Maximum number of tabs is nine–one of which is a pre-populated My Front Page. It’s simple to drag and drop feeds among columns and tabs, and to set the number and length of posts to display within each feed. I use this for some work-related newsfeeds, as well as for personal topics. My Yahoo provides a visual change of pace. There is so much information that even with filters; it is difficult to absorb everything all the time. However, successful association leaders use information filters to better understand the most relevant data they need. The most effective leaders inspire their Boards and staff to also engage in 360 degree thinking, which enables the organization as a whole to benefit from a wider, broader, deeper and more informed point of view. These information filter tools work well for me – give them a try. Developing and maintaining awareness of your environment is a first step towards gaining mastery and developing insights and foresight in your industry. Additional reading: From Insight to Action: Six New Ways to Think, Lead, and Achieve, by Jean Frankel and Gabriel Eckert, ASAE Association Management Press (September, 2012). The author: Jolene Knapp is a Senior Partner at Ideas for Action, LLC.—a consulting practice driven by a passion to empower the potential of people and organizations. 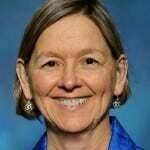 She is nationally known as a leader in association and non-profit management and governance. Her calm, positive, and inclusive style and her success in building, leading and sustaining membership organizations during constant change have earned broad respect in the industry. Jolene would welcome an introductory conversation with you: email info@ideasforactionllc.com.